The 25th annual Nobel Peace Prize Forum—a conference that celebrates the importance, consequence, and controversy of Nobel Peace Prize Laureates—is March 8-10 in Minneapolis. 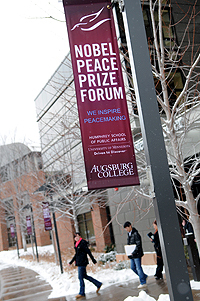 "This event brings members of the world's most exclusive club—Nobel Peace Prize Laureates—to campus," said Maureen Reed, executive director of the Nobel Peace Prize Forum, which is housed at Augsburg College. "Students, faculty, and staff have the opportunity to interact with people who fundamentally have changed and are changing the world." Reed said that the Forum brings global, national, and local leaders in business, health, science, and international issues to explore and discuss with attendees issues related to peacemaking, world security, and global stability. The Forum also is an opportunity to explore the controversy that accompanies many Laureates, and to understand why individuals "halfway across the globe" should care about one another. "One of the mission commitments of Augsburg is to educate students to be informed global citizens," said Augsburg College President Paul Pribbenow. "By bringing the world to campus, we also get to know our neighbors, which is fundamental to our identity as a college of the Lutheran church." – Laureate Muhammad Yunus, the "father of microcredit," speaks on Business Day, March 8. Yunus, who was born in Bangladesh and was a Fulbright Scholar, developed a movement to offer collateral-free loans to the poor citizens of Bangladesh. The Grameen Bank Project, grew into a full-fledged bank that has provided more than 8.4 million people—primarily women—with the means to better provide for themselves. – Dr. Paul Farmer, chair of global health and social medicine at Harvard Medical School, speaks at Science and Health Day, March 9. Farmer is co-founder of Partners in Health, which pioneered community-based healthcare in resource-poor settings. Farmer recently was appointed by the General Secretary of the United Nations to serve as special envoy to Haiti. – Laureate Tawakkol Karman, the "mother of the Revolution" and "the Lady of the Arab Spring," speaks on Global Day, March 10. The youngest Laureate and the first Arab woman to win the prize, Karman is recognized globally for her work as a human rights activist, journalist, and president of Women Journalists Without Chains. The Forum is the only program outside of Norway that is affiliated with the Norwegian Nobel Institute. The program is housed and coordinated by Augsburg College in partnership with the University of Minnesota and five other Norwegian Lutheran colleges. The Forum's generous corporate sponsors, including major sponsor Land O'Lakes, make the Forum possible. Learn more about the Forum and its history at nobelpeaceprizeforum.org. All college/university students, faculty, and staff and members of the community must register to attend the Forum; register for one day or multiple days. Augsburg students, faculty, and staff can attend for a discounted price. Student tickets are $10. Augsburg faculty and staff tickets are half price when purchased using the promo code listed in the January 15 edition of the daily A-mail.